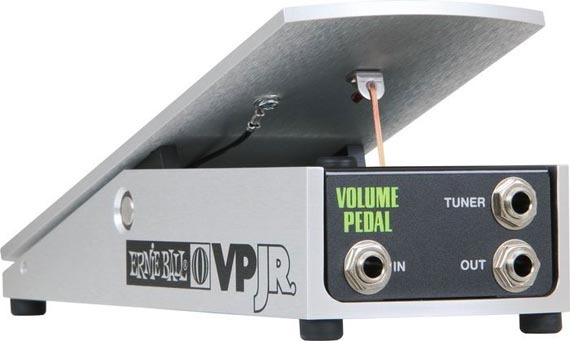 Ernie Ball 6180 VP JR 250K Review – Best Guitar Volume Pedal? Ernie Ball has a long history of making volume pedals for which professional guitarists rely on night after night. The Ernie Ball 6180 VP JR 250K is one of the distinct choices among many top players, being a staple pedal in their rigs when accurate and smooth control of volume is a must. In our Ernie Ball 6180 VP JR 250K review, we’ll find out if it’s really the best guitar volume pedal out there. But first, let’s see what separates this volume guitar pedal from the others in the Ernie Ball lineup and see if it’s the right pedal that you should be looking at. 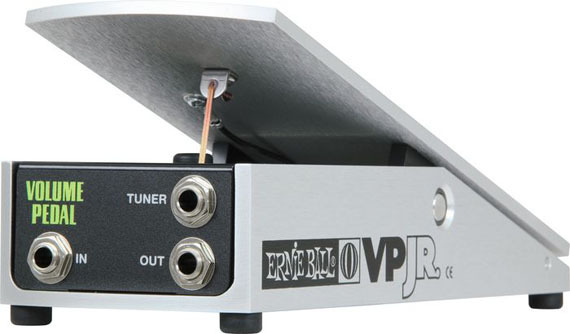 The most important feature of the Ernie Ball 6180 VP JR is its 250k potentiometer. The 6181 model has a 25k potentiometer instead. What does this difference mean? Essentially, the 250k potentiometer in the 6180 is for guitars with passive pickups. The 6181 with its 25k potentiometer is for use with guitars with active pickups such as EMGs or Seymour Duncan Blackouts. How do you know if your guitar has active or passive pickups? Here’s a simple rule. If you need a 9-volt battery in your guitar to power your pickups, then they are active. Most guitars have passive pickups which do not require batteries for use. This also helps make the 6180 the more popular choice among guitarists. Find out more about the Ernie Ball 6180 VP JR 250K at ErnieBall.com. A good volume pedal and be an indispensable tool for guitarists wanting a reliable way to control volume during a performance or simply for adding creative volume swells and dynamic effects to their playing. I put this pedal through all the tests for this review. First of all, placement of the volume pedal is important. Putting it at the front of the effects chain lets you control your volume before it hits and overdrive or distortion pedal. I fed the Ernie Ball 6180 VP JR 250K into a Fulltone OCD and found pleasing results. With the pedal all the way in toe position, my tone rang through at normal volume, unaltered in any way. With and without with the overdrive engaged, the 6180 let me “roll back” the volume nicely as if I was turning the volume knob on my guitar. This lets you add a really expressive dynamic to your playing without fumbling around with the volume knob on your guitar. Volume swells work well with the 6180 at the front of your chain as it takes your tone from clean to dirty as your signal increases into your pedal or amp distortion. This is vital for creating a dynamic soft-to-loud atmosphere in a song. Impressive control here. It’s also exceptional for controlling your sound before it hits your other effects pedals. I put a Line 6 M9 Stompbox Modeler in the chain and dialed in a nice chorus, delay, and reverb and had great results dipping the volume briefly before changing positions all up and down the neck while the effected signal sustained during my position changes. A whole new level of control is available by the simple addition of the 6180. Putting the pedal at the end of your effects chain lets you achieve a distinct effected sound with a carefully set volume from the guitar and then controlling the overall level with the 6180. This is good for say, fading out the volume of an effected sound that has a long delay setting. Volume swells are always smooth with the 6180. It gives you more freedom by using the pedal instead of trying to carefully roll back your guitar’s volume knob with your pinky finger with plucking stings. The micro taper switch lets you add a more dramatic increase in volume although I typically prefer the control of having an even swell rate. This is worth toggling to see how the performance of each setting suits your needs. The Tuner Out option is nice for guitarists who still use a non-true bypass tuner like the Boss TU-3. But if you use a tuner with true bypass like the TC Electronic Polytune 2, you might just leave the tuner in the front your signal chain without concerns about tone-sucking. UPDATE: Best Guitar Effects reviewer, Nils Bryant, had his Ernie Ball VP JR 250K break its “string” during regular use. This would be quite a bummer during a gig. We’ve lowered our allocated star rating below in response to this lack of reliable performance. The Ernie Ball 6180 VP JR 250K volume pedal is an essential pedal for controlling volume and adding expressive dynamics to your playing. More than just a volume pedal, it adds the ability to create lush volume swells and attenuate your volume for dramatic expression. It’s more convenient than using your guitar’s volume knob as you can keep laying down the licks while you tastefully adjust your volume level. If you’re looking for the best guitar volume pedal and for a bargain price, the Ernie Ball 6180 VP JR 250K is a solid choice. But due to potential for its “string” to easily break during regular use, you might want to pursue more sturdy options. That concludes our Ernie Ball 6180 VP JR 250K review. Thanks for reading. 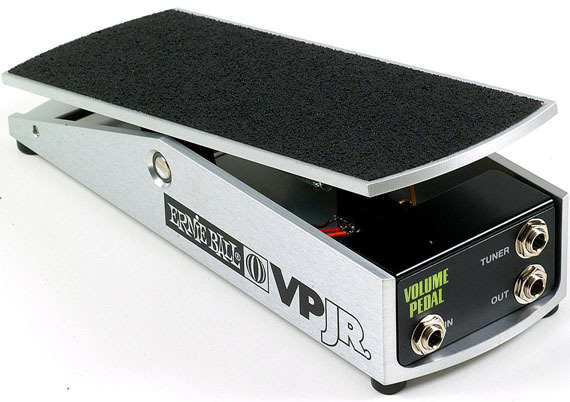 Want to buy an Ernie Ball 6180 VP JR 250K volume pedal? Beginner guitar? See our guide to online guitar lessons. So is there an Ernie Ball volume pedal that can be used with both guitars that have passvie and active pickups? Or another volume pedal maybe..